NEW PRODUCT SIZES !!! Sold by the each. These 350 million year old extinct celphalopod is a distant relative to the chambered nautilus. They occurred in many diverse species all over the world. These are from Madagascar. The $35.00 Single Polished Ammonites in Polished Matrix are approximately 8" to 9" across and about .25" thick. The $50.00 Single Polished Ammonites in Polished Matrix are approximately 8.5" to 10.5" across. 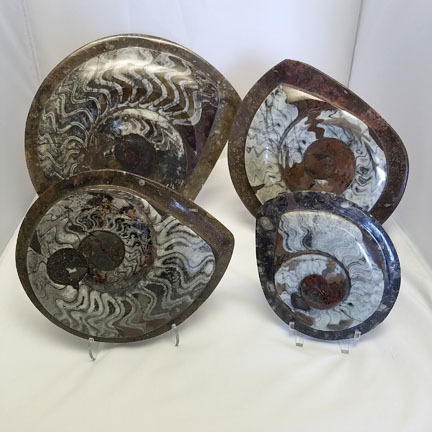 The $75.00 pieces are approximately 9"-9.5" across and the $100.00 Single Polished Ammonites in Polished Matrix are approximately 9.5" to 11.5" across. $40.00 piece is approximately 8.00" across to 7.0 wide. $100.00 piece is approximately 11" across to 14" wide. 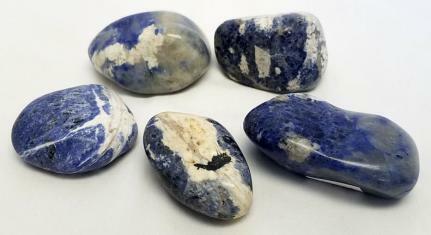 Although somewhat similar to lazurite and lapis lazuli, sodalite rarely contains pyrite (a common inclusion in lapis) and its blue color is more like traditional royal blue rather than ultramarine. It is further distinguished from similar minerals by its white (rather than blue) streak. Sold by each. NEW PRODUCT!!! Stand not included. 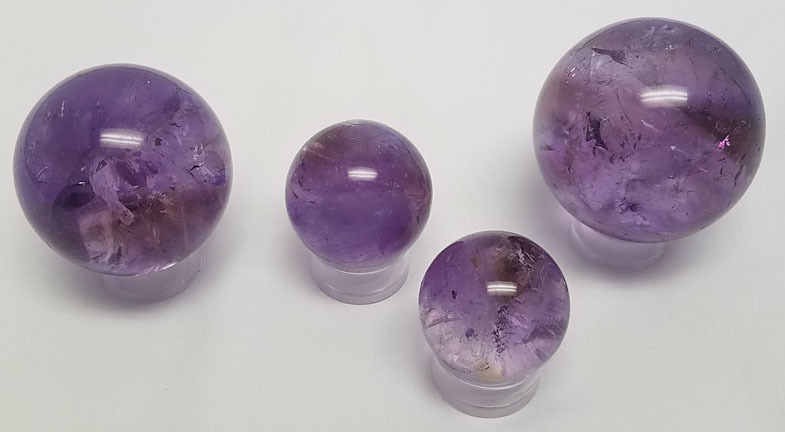 These beautiful Moroccan Polished Amethyst Spheres are another new addition to our Amethyst and Spheres line of products. They range in size from Small (1.5" diameter) to Medium (2.0" diameter) to Large (2.5" diameter) Amethyst is February's birthstone as well as 6th anniversary gemstone. Sizes are approximate and will vary in size and color. NEW PRODUCT!!! Sold by each. Phantom crystals are facilitators for self growth. 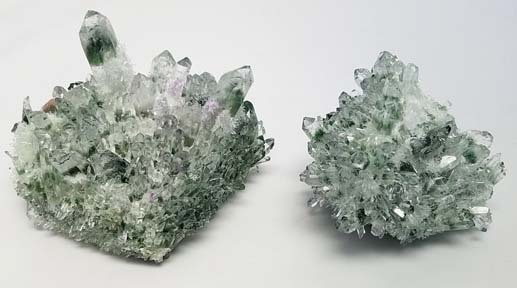 The Green (Chlorite) Phantom Crystals help work on self-healing and regeneration along with assisting in facilitating the detoxification process by removing unwanted energy. Priced at $46.00 per pound and available in 3 sizes at listed price ranges. Limited supply so order now! Price is $5.50 each, sold 5 pieces per pack. NEW PRODUCT!!! Polished Phantom Quartz Crystal Point. As you look inside a Phantom Crystal, you can see the ghost of additional crystals inside. These Phantoms are caused by a layer of dust settling on the crystal during the formation process and then the crystal continues to grow. 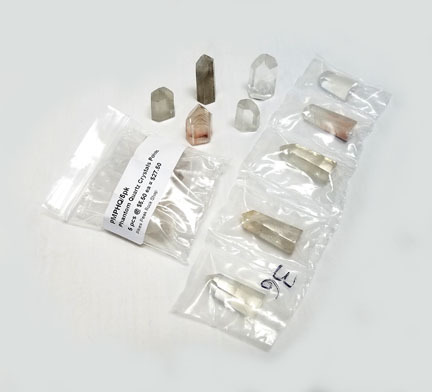 These Phantom Quartz Points are sold in a 5 piece pack at $5.50 each. Sizes range from 1" to 1.5" tall and approximately 0.5" wide. The points have a cut base for ease in displaying. Rough Smoky Quartz Boxes are another addition to our ever growing line of flatted minerals. Each box contains 24 pieces of rough smoky quartz averaging $0.75 each. These pre-boxed chunks are protected by a plastic "egg crate" so that each piece is cradled for safe shipping. 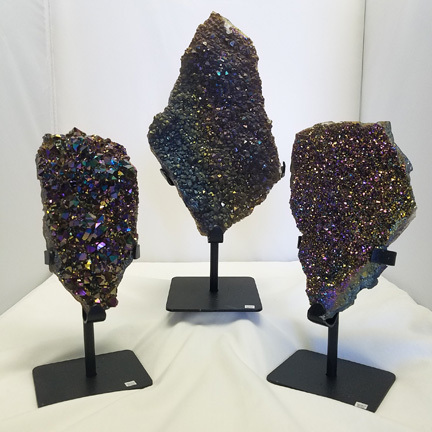 Our new Angel Aura Quartz Clusters are an eye-catching new addition to our line of Quartz products. 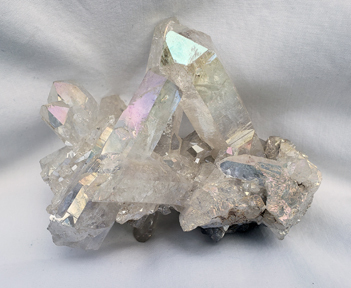 The Angel Aura Quartz gets its prismatic iridescence from a coating of Platinum and Silver, sometimes Gold or other trace metals. Price is calculated by weight and range from $1.00 to $25.00 each. 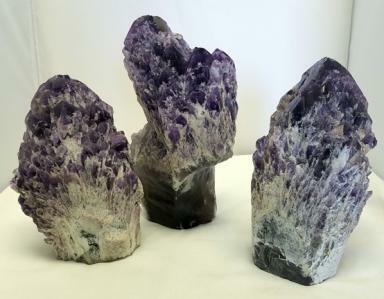 Amethyst Cluster Point with Natural Sides. The top is polished and sides unpolished. Price will range from $4 - $15 each. Approximate size: 2.5" to 4" tall. 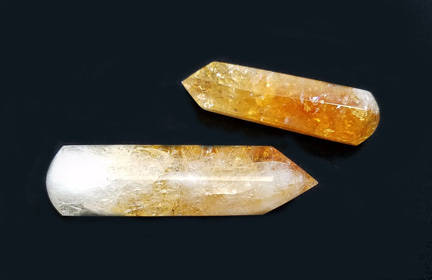 These beautiful polished Citrine massage wands are from Brazil and are expertly cut and polished. Prices range from $5 to $10 for small (2.0" - 3") and $11 to $20 for large (3.5" - 5"). Each piece of this stunning Aura Amethyst has been hand treated with a thin coating of titanium to give this already beautiful Amethyst an iridescent gleam then mounted on a black metal stand for ease in displaying. These lovely clusters come in every shape and size imaginable! This is a product of natural and priced by the pound so shape and size will vary. 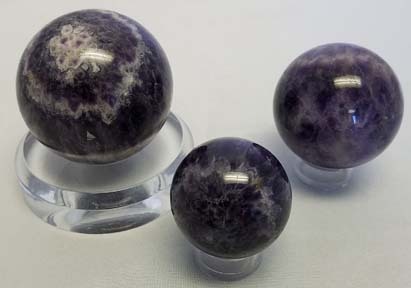 These gorgeous AA-Grade Polished Amethyst Spheres are cut and shaped from Brazilian Amethyst. They range in color from pale lavender to a deep, smoky purple. 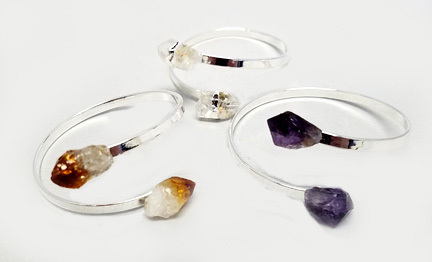 Amethyst has potent metaphysical properties for spiritual healing & bring intense spiritual growth. It is the February's birthstone as well as 6th anniversary gemstone. 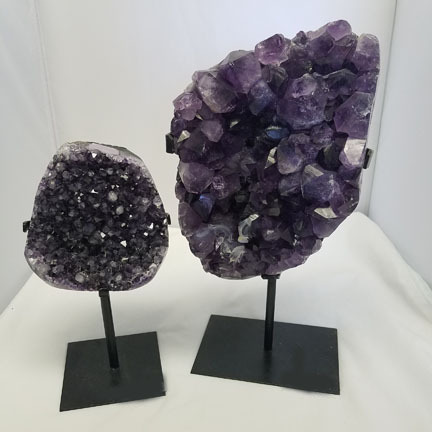 Brazilian Amethyst with Polished Edges is the newest of our products displayed on a metal stand. 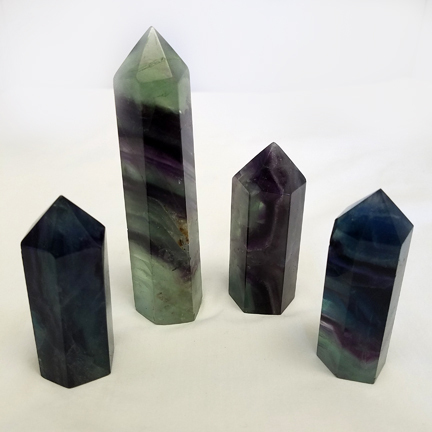 A great addition to your Amethyst collection! NEW!!!! Sold by each. One time special offer-3 in stock! 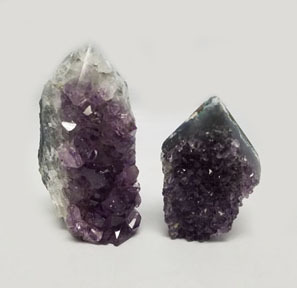 You can recognize an Elestial Amethyst by its shape. Usually having one main crystal with smaller fully terminated crystals surrounding it, these crystals are keepers of information stored in their matrix in the language of light. In using these types of crystals, one may access information that goes beyond space and time. Like a book at the library, these crystals are especially useful for lightworkers and healers who are interested accessing the repository of knowledge they contain. Limited supply-no backorders for this item. This product is priced by weight, so the size and shape of the crystal will vary.